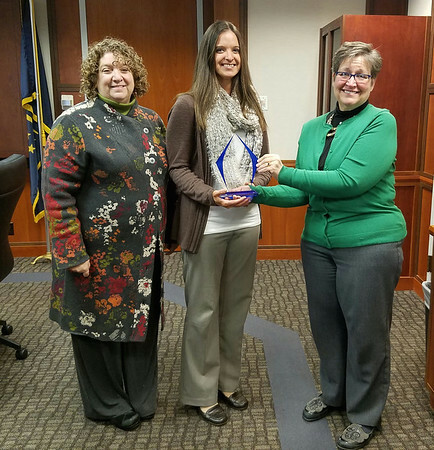 This is the inaugural year for the Provost's Award for Excellence in Student Learning Assessment and Improvement, which is designed to recognize programs for exemplary assessment but also to help embed assessment in Indiana State University's culture. The recipients of the 2016 Provost's Award for Excellence in Student Learning Assessment and Improvement are the BS in Accounting and the EdS in School Psychology. To be nominated, these programs completed Student Learning Summary Reports deemed to be the best in their college at documenting how well students are achieving program outcomes and how hard faculty are working to continuously improve student performance. To win the award, the recipients demonstrated they did this better than all the other nominees. 1. Assessment has encouraged faculty to be more mindful of the measures being used to judge learning in their 300- and 400- level accounting courses. a. Measures have been evaluated for appropriateness and modified when deemed necessary. For example, in one course a grading rubric was modified to include progressive levels of performance rather than the 100 percent, 50 percent, 0 percent scale originally used. b.	Consciously tying multiple-choice exam questions to concept, has helped faculty identify which areas of instruction require additional emphasis, whether it be through additional class lecture, an extra problem demonstrated in-class, or through graded, assigned homework. c.	Most recently, the suitability of performance targets was reconsidered and reframed to include levels for superior, satisfactory, developing, and deficient achievement. Having targets that are clearer and more aspirational will provide more meaningful data to improve student success. 2. Assessment has fostered continuous instructional improvement within the accounting program. a. It has made the faculty better teachers by inspiring them to reflect on their teaching and students' learning, particularly when targeted performance proved disappointing. b. In response to assessment results, the pedagogical dialogue among the accounting faculty seems to have increased. Faculty are sharing best practices and trying new teaching strategies. For example, one individual is currently in the process of flipping the cost accounting class. Over the last several semesters, another individual has class tested the online accounting learning systems from different publishes, ultimately settling on the platform that seems to provide the best adaptive learning experience for building individual proficiency. In the individual income tax class, a comprehensive case that requires the preparation of actual tax documents has recently been added to the curriculum. 1. A comprehensive program revision was implemented in fall 2013, including two new courses, multiple revised courses, and a revised course sequence. A nationally standardized certification exam (i.e., PRAXIS-II) has been used as an indicator of content knowledge, with overall pass rates increasing from 80 percent in the two years prior to revision to 100 percent in the first cohort of students who completed the revised program. 2. The annual student review process was completely revised in 2012-2013 to provide regular, rubric-based evaluation and feedback to students related to both program goal areas and specific professional dispositions (e.g., dependability, integrity, respect). The review has enabled us to address both academic and dispositional concerns early in students' program of study and provide supportive and structured remediation when necessary, thus reducing both the number and severity of concerns throughout students' time in our program. 3. Continuous review of data from the culminating project for the EdS degree has helped to identify inconsistencies in students' integration and application of knowledge from multiple courses. As such, we have undertaken efforts to address potential concerns by (a) adjusting our first-year field experience to more closely mirror the problem-solving process expected in the culminating project, (b) examining the content in our foundational coursework to ensure critical concepts are introduced and practiced, and (c) examining the project rubric to ensure the expectations are clear and the evaluative criteria capture the skill areas intended. Our hope is to see improved consistency and higher levels of performance over the next three-year period. Susan Moncada accepts the award for accounting; Carrie Ball accepts the award for school psychology. In addition to the "crystal," recipients receive $2,500 for their program to use to further student success efforts. The awards are designed to recognize programs for exemplary assessment but also to help embed assessment in Indiana State's culture.